Who will still fail the residence test? People who need to challenge poor decisions by the UKBA not to grant lawful residence. “Today I met a woman who wanted to live in the UK with her British husband to care for their severely disabled British child. The family couldn’t afford the application fee so the UKBA refused to consider it. THANKS TO LEGAL AID, I got permission to have this decision reviewed by the court. The UKBA delayed a year before granting her leave to remain. 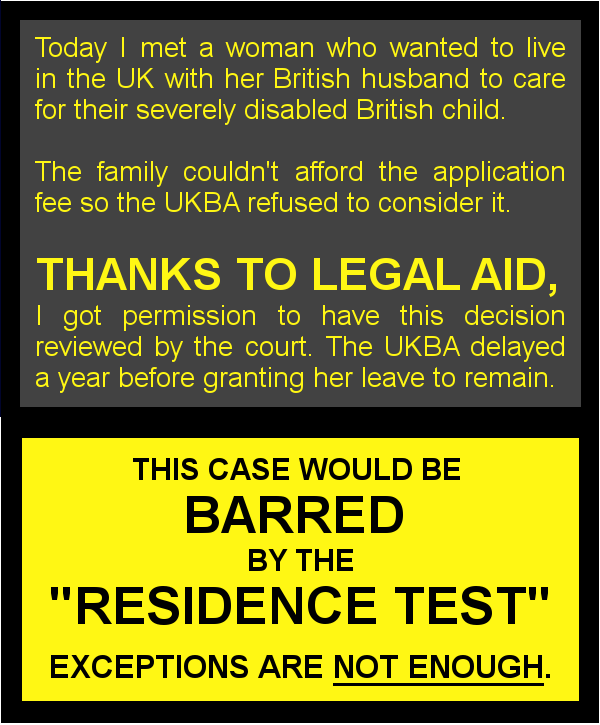 This entry was posted in Cases that will fail the residence test, Clients with disabilities, Immigration and asylum and tagged cuts to legal aid, Legal aid, save legal aid, save UK justice by thanks2legalaid. Bookmark the permalink.